Mexico was never really a big part of the travel plan, the reason for coming here was Cancun was the easiest and cheapest place for myself and my girlfriend to meet coming from Canada and Europe. We didn’t intend on doing anything here really. This changed when I found the Cancun Underwater Museum which looked incredible to someone like me who’s addicted to scuba diving! It wasn’t possible to dive the museum on day 1 so that fell to going to the beach. And wow what a beach, crystal clear blue sea and white powdery sand. Sadly, the many hotels that are on the beach try to deny access to non guests and there are limited public access points.Luckily for us, once you are on the beach it can be easy to use some facilities at hotels. Thank you very much Ritz-Carlton, you make a tasty margarita and have a luxurious pool! As silly as it sounds, I’d actually be tempted to book one of their hotels one day now as I know how good they can be while the Melia that denied access I might avoid. Funny how little things like that can influence your opinion! As for the museum, it felt a bit like a wreck dive with many different cement sculptures. The idea of the museum is that is will eventually become the home to a new coral reef on top of the artwork and help reduce to the pressure on Cancun’s other coral reefs, a very nice idea I think. Immediately after a short descent to 10 meters we came to an inspired replica of the terracotta warriors. Some of which you can put your regulator up to and purge bubbles through the sculpture so it looks like they are exhaling underwater! The sculptures are already developing plant life on them which perhaps takes away a bit of the drama but is good for the longer term plan. Later in the first dive we came to a sculpture of a VW Beetle (a car formerly made and still loved in Mexico) as well as a cube of bricks. Both were already becoming home to small fish. My favourite part of the experience came in the second dive. I didn’t realise the museum was spread over such a large area so when we came to a sculpture of a man at a bar, writing something with a tankard near his hand and a dog asleep by his feet I was really taken aback. It’s nice that for someone who grew up in Lancashire and Yorkshire there is a little part of home sat at the bottom of the Caribbean Sea! On the way to the border with Belize where this trip was really planned to begin we stopped off at the town of Tulum – known for its Mayan ruins by the sea. However it wasn’t these that we enjoyed the most (especially after a visit to Tikal in Guatemala, but more on that in a later post). All around the coast in this area are features known as cenotes. This is where the limestone rock collapses due to the vegetation above and to form a hole down into water running below. 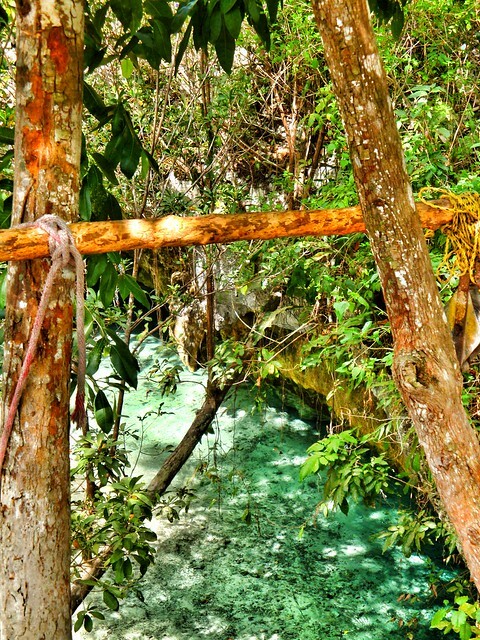 Near Tulum is the Grand Cenote where you can swim down into the caves with tropical freshwater fish (like you may have in an aquarium at home) as well as with terrapins. It really was a refreshing and well needed experience after the cycle from town in sweltering temperatures. Although a bit touristy, Tulum was a fairly relaxed place with one of my favourite treats of the tropics – sugar cane! 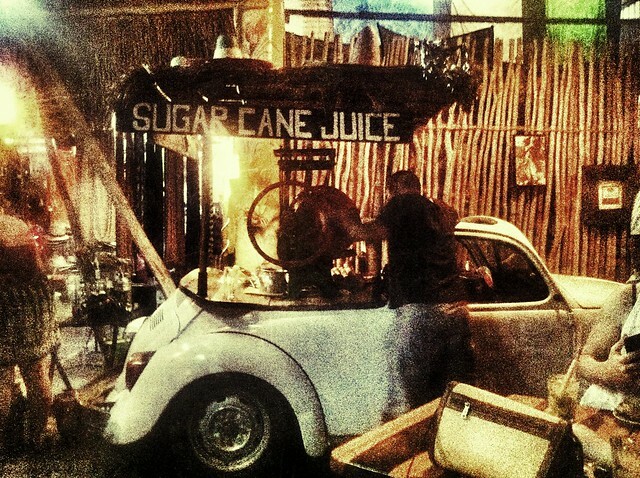 And I’m not sure you’ll see a better sugar cane juice vending stand than a converted VW Beetle! It was an especially good addition to a mojito! P.S. If you’re reading this before you leave Mexico to enter Belize and are using the Lonely Planet guidebook for Central America. There might be a couple of things I can clarify. 1. For a bus to Belize from Chetumal you need to go from the new market, not the bus station in an old American style school bus. 2. When leaving Mexico you may be charged 200 Pesos to leave via land. If you arrived via air be persistent as this tax should be included in the cost of your air ticket and therefore not be valid. If you are reluctant to get your wallet out they should just wave you through. This entry was posted in Central America, Mexico, Travel and tagged belize, cancun, cenote, Central America, latin america, lonely planet, mexico, mojito, photo, ritz, scuba diving, sculptures, tulum, underwater museum by nihaoxiongmao. Bookmark the permalink. My boyfriends blog to keep you all going till I write my next post….hopefully soon! Sounds like you are both having a great time. Just remember to stay safe. Oh we are! We’ve been careful but people have been pretty friendly so far, especially in Belize. Oh it was, and I’m hopefully going to the Blue Hole on Monday (best dive site in the world apparently!) Kat is doing her diving qualification soon too – I really recommend it. These pictures of Mexico are amazing, I’ve never been, which is crazy, since I’ve lived in California all my life! Thanks very much Matt – I suggest you head on down! The dive you made from Cancun is actually part of Isla Mujeres not Cancun… so next time come and stay on Isla. You’ll like it MUCH better than Cancun. Cheaper by far, easy access to amazing beaches (Playa Norte is considered one of the best in the world)… From the Cancun airport there are several ways to get to the Ultramar Ferry landing at Puerta Juarez. 20 minute ferry ride over gorgeous turquoise water and you’ll be there. I checked out your blog because we’re heading to Belize for a few days next week. Lovely photos, looking forward to shooting there!